enter teppay, the traditional japanese/sushi joint known for always being filled with japanese businessmen. the small restaurant was packed at 9 pm on a friday night. there was a large japanese party happily drinking, eating, and making a ruckus. thankfully we got a seat at the sushi bar on the other side of the narrow space. there were lots of other couples there, both anglo and asian. i couldn't tell which of the other asian patrons were japanese. i'm pretty bad at guessing based on appearance alone. it kind of erks me when people think they can and take the liberty to involve me in trying to guess my ethnicity (i get korean all the time) and especially if they aren't asian themselves. anyway, i knew the large party was japanese b/c they were talking very loudly. i can distinguish between the asian languages by ear. it's not hard. so we're at the sushi bar. our 18 year old, very charming sushi chef named simon took care of us. (there was also a much older sushi chef behind the bar too, definitely way past the legal drinking age.) simon tells us that the horse mackerel (aji) just came in today and was very fresh. i ask simon if horse mackerel tastes anything like spanish mackerel which i dislike. he says its much milder. simon pulled out a 6 inch silvery fish for us to inspect. "is this big enough?" after a nod from us, he started busily chopping scallions. a few minutes later, a small plate was placed in front of us. 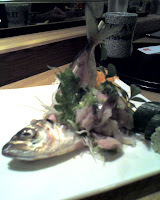 the fileted mackeral was skewered into a bow like fashion and below it on a large shiso leaf was the fresh mackeral diced into smallish sized pieces with the skin still on. the finely minced scallions and chopped shiso was mixed into this tartare. 2 thick slices of english cucumber (i don't think it was japanese b/c the skin was so smooth) and freshly grated wasabi garnished the plate. the horse mackerel was lovely, just amazing. no soy sauce was necessary. just a tiny bit of fresh wasabi (which is SO MUCH better than the stuff made from powder) with each bite. when we finished the plate, the mackerel remains were set to the kitchen and reappeared deep fried. we picked small bits of fish off the fish bone and tail. i started nibbling at the cheeks and the young sushi chef told me he just eats the whole head. ahh, like fried amaebi heads! i get it. eating a fried mackerel head was definitely a bit more dangerous than smaller shrimp heads, but my friend and i got it down. delicious! next we each ordered a spicy chopped scallop and spicy hamachi handrolls. first of all, the nori sheets were freshly roasted and still crisp. what a difference it made! the scallop handroll was creamy, the fresh scallops were sweet. the scallop bits looked more like teeny-tiny bay scallops than chopped up scallops. the spicy hamachi containing finely minced scallions was okay. i was glad that there was no mayo in it. the quality of the hamachi was decent, not great. then our chirashi arrived. i like to think of chirashi as the poor man's omakase (this one was $23). 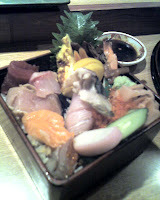 it's at the chef's discretion what goes into the chirashi, albeit most of the ingredients usually stay the same. today we got a piece of sake, hamachi, maguro, ebi, suzuki, hirame, unagi, tako, shiro maguro (albacore), saba, tamago, and tobiko. the tamago was just made and still warm. the egg omelet wasn't overly sweet and this was the first time in years i could remember actually finishing a whole piece. yamagobo and sweet marinated shiitakes also came in the cute chirashi box. i appreciated that they skipped the fake crab, but the quality of most of the fish left something to be desired. a few pieces were stringy and probably shouldn't have been served. we ended the meal with another two orders of sake nigiri. will i come back? most definitely just to hang out with simon and see what other delicacies are behind the bar on a non-weekend night. chef recommendations seem to be the way to go here. i also spied 2 ramens on the menu which i will have to come back for continuing my ramen quest. my sushi restaurant of choice is still sage 400. the quality of their seafood can't be beat and i love some of the modern japanese fusion items on the menu. but i'll save that for a whole other blog posting. Check out the website AllLookSame.com. They've got a test that will show you a bunch of Asian faces and you have to guess Chinese/Japanese/Korean. I did it a few years ago and scored 7/20 - which is not to brag, I think it's approximately the same score if I didn't look at the faces. It's HARD! I like to think I can distinguish the languages by ear as well, but that's not an invitation to test me. Hi... just started reading your blog and enjoying your reviews. Just a quick comment on your ramen quest in Houston. The closest thing to the type of ramen you are looking for in Houston is the tonkatsu ramen at Teppay. The broth is rich, milky, and full of flavor. The owner once told me that it takes many hours of slow cooking to extract the milky-like consistency of the broth from pork bones.... which is to justify the high price tag. Not quite as good as Japan, but good for a quick fix in Houston. @anonymous - actually had the tonkatsu ramen during my more recent visit to teppay. you are right, it was just pretty good as far as ramen goes but definitely the best i've found in houston so far. thanks for reading! teppay's tonkotsu broth is definitely one of the best broths I've had, and I've had a bunch (including sontouka). the sad thing is, and this is what makes the bowl a not-too-exceptional bowl, is that the meat is terrible, the other garnishings are mediocre, and the noodles are crappy. I go there and tell myself I'm paying $12 for some damn good broth. Which is worth it, when I'm in the mood. I've had pork bone broth in LA that don't come close to the complexity and smoothness of Teppay's. I swear, with Teppay's broth, some excellent hand-made ramen noodles from tokyo, and maybe the chasu from momofuku in NYC, and you'd have the perfect bowl. In the world. But I digress. I'm merely trying to cast in my vote as well for Teppay as best ramen in Houston, if only on the merits of the broth.